It takes vision. It takes talent. It takes commitment. 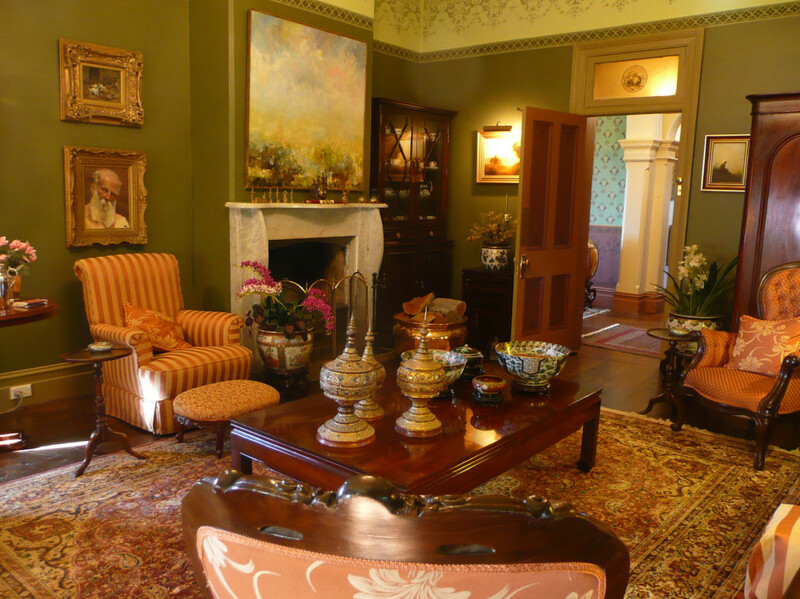 And it takes incredible courage to tackle a project the size and dimension of Grenfell Hall in Central New South Wales … turning it into the amazing homage to Victoriana country living that it is today. 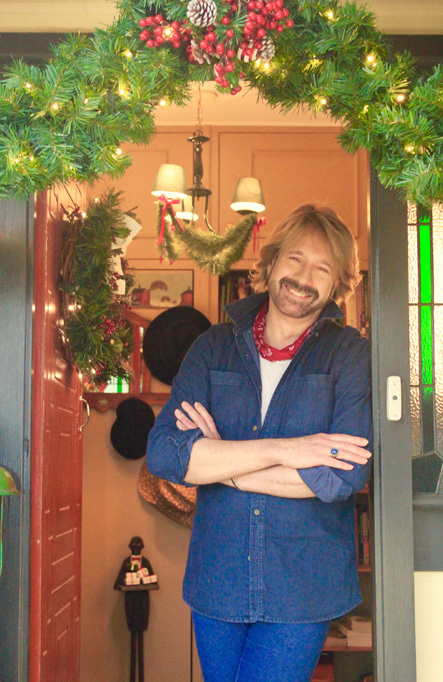 Warwick Crampton is the gifted visionary who, with the basic help of a specialist tradesmen, has turned the two-storey residence into much more than a gracious period-appointed home which he proudly shares with invited guests. Grenfell Hall is testament to one man’s commitment to detail, seen in every part of every room of the home … a home which can truly be described as a ‘step-back-in-time experience of classic refinement and elegance’. 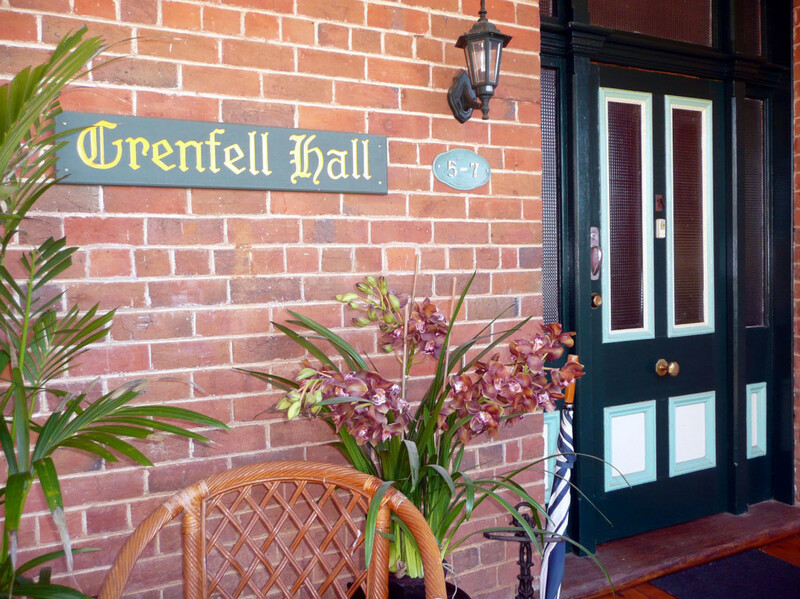 Grenfell Hall is also the coming to fruition of a vision that has changed the world of its owner and, by extension, that of the growing list of special guests who have ventured along to experience this unique piece of Australian country hospitality and elegant, eclectic post-Victorian style. 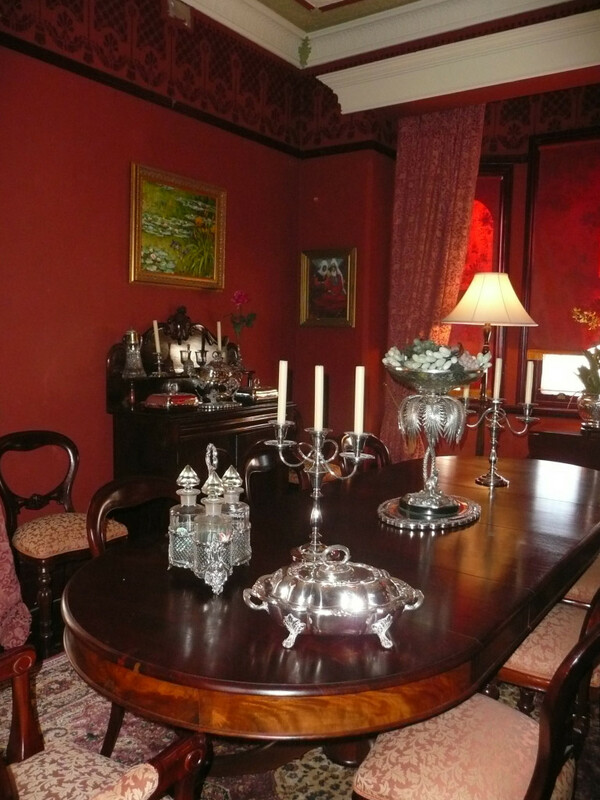 The décor and appointments of Grenfell Hall – so named by Warwick in a return to the property’s original appellation as given by its founder, Billy Robinson, in 1907 – are truly inspirational, especially in terms of the amount of care and attention to detail that has been lavished on every room. 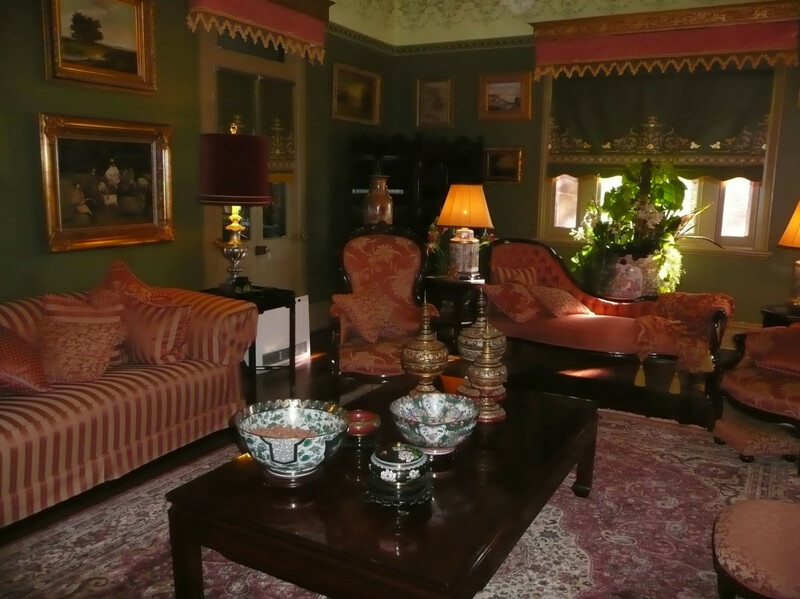 Many aspects of the interior are also a direct reflection of the fact that, throughout the years and his many professional overseas postings, Warwick has collected an enormous cache of marvellous treasures and memories of past adventures, these now filling every part of the Hall. As Warwick explains, despite its fine Victorian appointments, Grenfell Hall was actually built in the Edwardian period. It’s original owner, Billy Robinson, was a successful pastoralist. Owner of Myee Station, he built the home as a private ‘town’ residence and lived here until the early 1920s when the home was sold to a Mr Simpson who was, at the time, the Mayor of Grenfell. In the mid 1950s, it was sold to the Catholic Church and became a convent, with eight teaching nuns from the Order of St Joseph living here. It was during this time that a chapel was added, giving rise to many local people still referring to the old mansion as ‘The Convent’. When the Church sold the home in 1972, the Hall was to see a succession of various owners and gradually fell into disrepair. It was converted into flats at one point and little maintenance was done until, in 1997, the old home was purchased by a gentleman named Darryl Tempest-Mogg and his wife. And so began a painstaking restoration process to bring the property back to life. “The Tempest-Moggs where the first to lavish care and attention on the old place in decades. 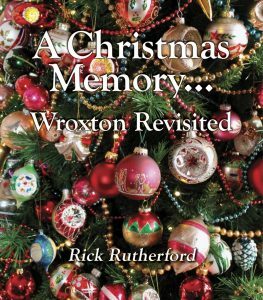 Their vision was to re-appoint many of the period features of the past … a mission they admirably achieved” Warwick explains. “During the 1980s there had been an extension added, with mezzanine floor above. The original cookroom – with its wonderful fuel stove was retained – the new kitchen being decorated in tones of yellow and white to reflect the canola fields of the surrounding region. “When I came across the property in 2010, I fell in love with the architectural aspects of the building which, despite being built in Edwardian days, are really more Victorian in style. I also saw the potential to further enhance the work that the Tempest-Moggs had begun. 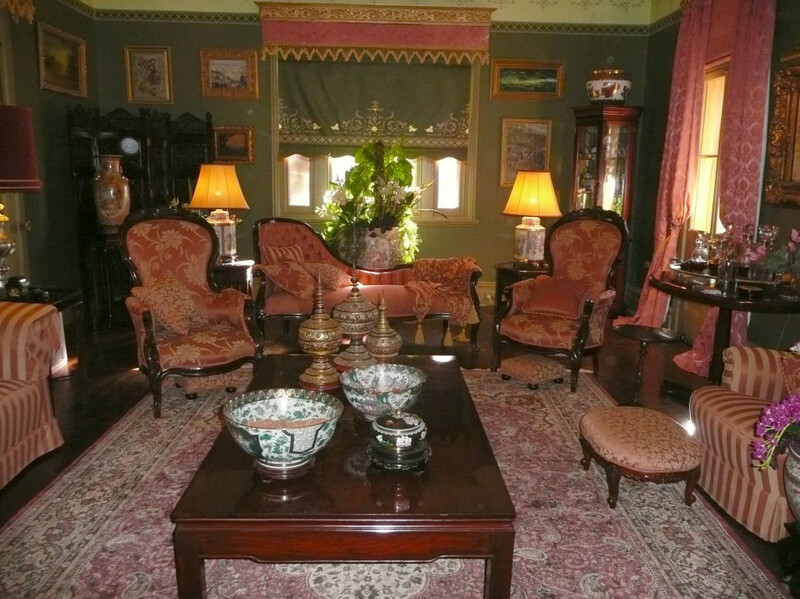 Ever since, my vision has been to embellish the original appointments and breathe new life into the home to give it back the integrity and character it would originally have had … the secondary benefit of the exercise being that the home has become a wonderful showcase for all the furnishings, artifacts and collectables I have gathered from over 30 years of living abroad” states Warwick. Purchased initially as a place in which to retire, Warwick soon realised that Grenfell Hall is far too important and significant not to share with others, and so, just this year, he made the decision to open the home as a B&B venue. Originally the two-storey residence had three large upstairs bedrooms – all of which are now available for bed and breakfast letting – and bathroom facilities which have been enhanced by Warwick to create two country washrooms … one with traditional roll-top bath and the second with a contemporary shower cubicle. As part of Warwick’s restoration process, the chapel downstairs has also been turned into the most amazing, character-filled bedroom, complete with French antique prie-dieu and elaborate king-size bed. A storage room across an adjoining corridor has been turned into a private ensuite bathroom, this area of the house being available for B&B letting when the need and occasion arises. Otherwise it is used by Warwick as his private quarters, as is a mezzanine lounge room upstairs that overlooks a relatively new kitchen extension. 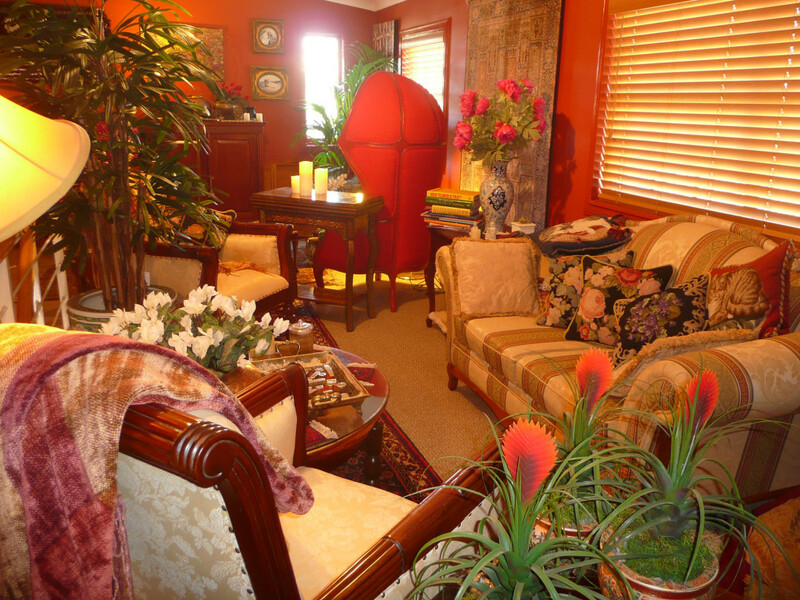 Because of its private use, it is within this private upstairs lounge retreat that Warwick has really let his love for the exotic unleash. With Haynes ‘Burnt Oxide’ walls, rich timber venetians, Regency brocade lounge setting, amazing canopy chair which Warwick upholstered with a rainbow collection of Chinese silks, Kashmir silk wall hanging, prayer corner, aboriginal artworks and Syrian mother-of-pearl inlaid table, it’s an eclectic space that truly reflects the character of the man himself and showcases the diversity of his amazing collection. The exterior of this part of the house – which is a new 1980s addition incorporating modern cookroom downstairs and mezzanine retreat above – blends seamlessly with the earliest part of the building by way of a clever paint treatment which Warwick used, matching paint colours to that of the original brickwork. If first impressions say anything, the overall exterior of Grenfell Hall undisputedly states that its owner has lavished every care and effort to make it as handsome and pristine as it was when originally built over 105 years ago. Triple ochre red bricks; stippled glass window sashes trimmed in Brunswick green; heritage turquoise and cream trims; new timber verandah footings; meticulously tended gardens and other such exterior appointments all add up to make a statement of yesteryear reborn. The front entrance of Grenfell Hall certainly confirms such things, with its cedar staircase rising to bedroom accommodation on the first floor. The walls feature wonderful hand-stencilled work typical of that seen in homes built during the mid to late Victorian period. The former owners completed stenciling the lower wall dado area while Warwick found inspiration for the upper wall section from Melbourne’s Heritage Stencil company. American decorating books were his source for the elaborate hand-painted frieze above. The floor throughout the entrance is black japanned Cypress pine, with a tung oil finish. The going underfoot is softened with an Iranian garden-design rug while the staircase treads are protected with machine-crafted Axminster carpeting. 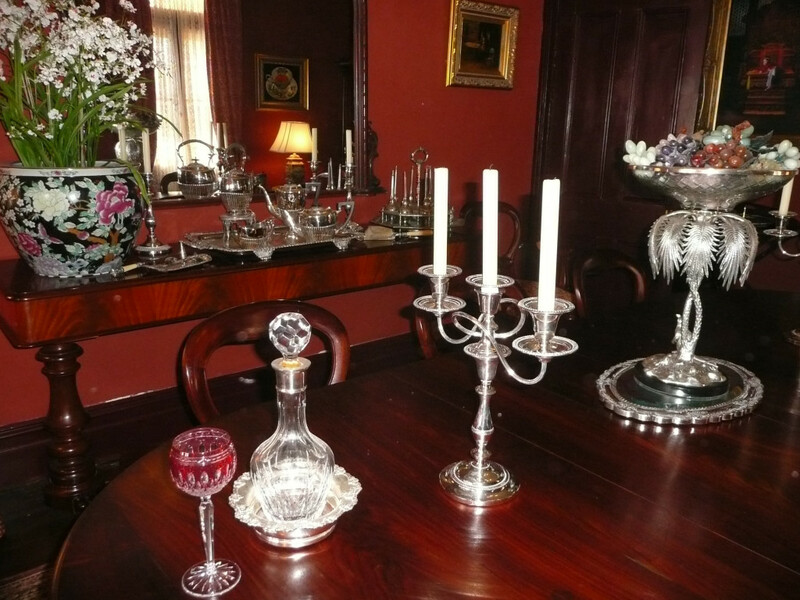 The decorative trappings in this part of the house offer the first glimpse of the treasures and treats to be found throughout every other part of the mansion, not to mention providing just the first insight into Warwick’s wonderful talent for being able to bring a host of otherwise disparate objects together to create a luxurious harmony. A brass 1870s water ewer from Pakistan, an inlaid campaign table again from Pakistan, and a Tang Dynasty urn filled with silk orchids all perfectly complement the meticulously-restored period features of the space. To the left, off the entrance, is a room Warwick has designed as a library – a rich and cosy space which he generously shares with B&B guests who can snuggle up here in winter to watch television or use the computer facilities that are set up on a cedar partners desk. Caramel-toned taupe walls match with silk taupe drapes that were custom-made for the room by Warwick (the talented home owner made all the drapes and blinds throughout the entire house), while ample comfort is provided by a two-seater sofa covered in a Warwick Fabrics rich brocade and a ‘Purda Houslow’ Afghani rug underfoot. An impressive Victorian cedar bookcase dominates the main wall of the room. On the opposite side of the entrance lobby is the residence’s two formal entertaining spaces – the dining room and drawing room. The main decorating treatment Warwick executed in the dining room has been to repaint the walls a rich, exotic burnt red which he chose as a consequence of scraping a section of wall area to find this marvelous typical-Victorian colour underneath. The frieze which was in place when he purchased the home has been maintained as part of the wall decoration. At the windows, old printed canvas blinds have been painted by Warwick to create a wonderful damask effect, then finished with impressive fringing to add an opulent touch. The window treatment is completed with brocade drapes which Warwick fashioned to replicate the look of an old theatre set. The pressed metal ceiling is painted an off-white with burgundy and grey trim to match the skirting in the room. 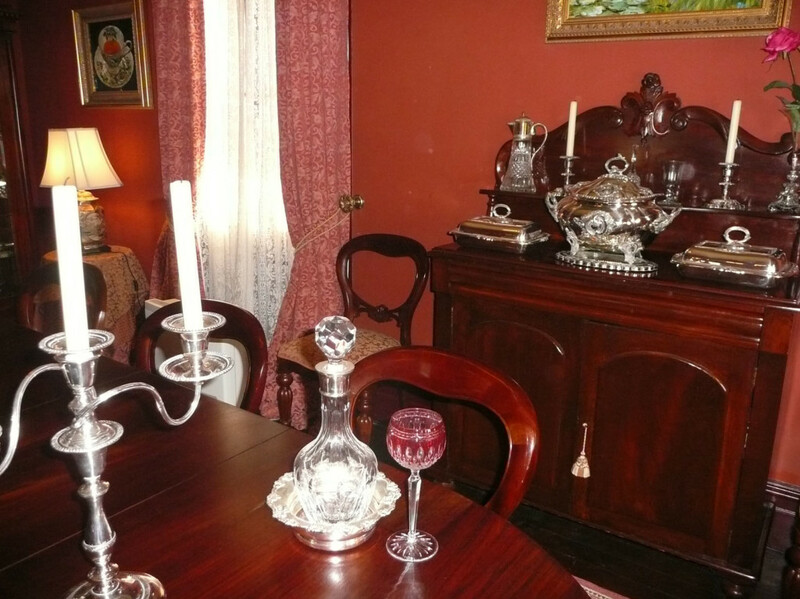 Warwick tells that this is the room where family heirlooms really take pride of place, including a beautiful antique chiffonier, serving table and an abundance of splendid antique silverware. The table is handmade rosewood, teamed with a dozen balloon-back chairs to ensure guests always dine in the finest style. A wonderful ‘Native Grass’ green by Wattyl – which Warwick describes as being somewhere between a deep olive and forest green – sets an enveloping mood of serenity and peace within the adjoining drawing room. A Victorian-style painted frieze tops the walls and is reflected in the painted and stenciled treatment Warwick created on canvass blinds at the windows. Made by previous owners, an elaborate pelmet – crafted of plaster that has been gilded and shellaced – tops the window alcove. Again Warwick created the special, theatrical window treatments to play up the occasion of the space, using fringing and drapes to optimum effect. As he explains, if one closely examines the room, it sports a clever combination of mini spotted, striped and large brocade fabrics which all harmoniously interact due to the common terracotta colourway. 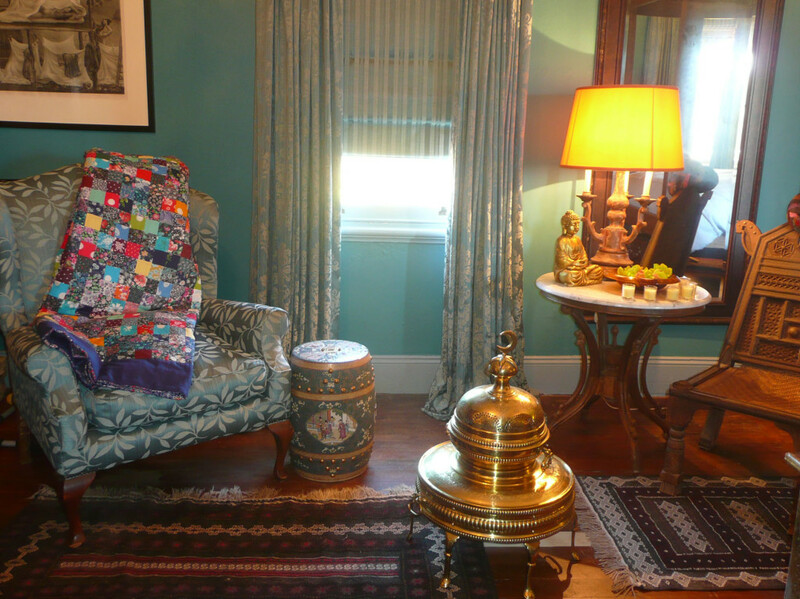 Exotic furnishings here – from Warwick’s lifetime ‘grand tour’ – include a coffee table that was handcrafted in Pakistan; gilded beetle nut holders from Myanmar; handcarved Indian screen with mogul design; a Victorian chaise which he found in Chile; and pair of matching grandmother and grandfather armchairs. Original to the room, a Carrara marble fireplace creates a wonderful focal point. The etched glass fanlight above the door – with its fruit and autumn leaf motif to reflect the pastoral interests of the original owner – leads back into the entrance hall, the door treatment being see throughout the main formal areas of the rest of the house. Just off the drawing room is a lush, tranquil space that Warwick has created with a lavish showing of both real and artificial potted plants … the faux being so real looking it’s almost impossible to tell the imposter from the authentic. 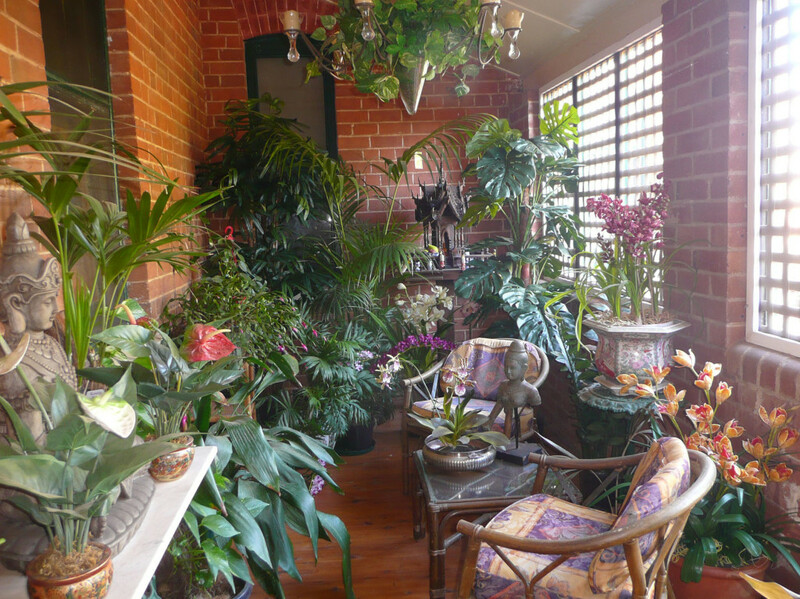 This conservatory space was actually a huge dog kennel when Warwick purchased the property. With new cedar flooring and guttering that enables water on the floor to effortless drain into the adjoining garden; lattice screening that’s lined on the inside with mesh to allow breezes in and keep bugs out; casual furnishings and all the lush greenery, this is a superb refuge for relaxing, especially in winter as the western sun filters through. The chapel bedroom, ensuite bathroom, original kitchen (which Warwick has decorate in tribute to the cookrooms of old, complete with a retinue of vintage kitchenalia) and modern new kitchen and adjoining eating area, plus compact laundry complete the list of rooms on the downstairs level. 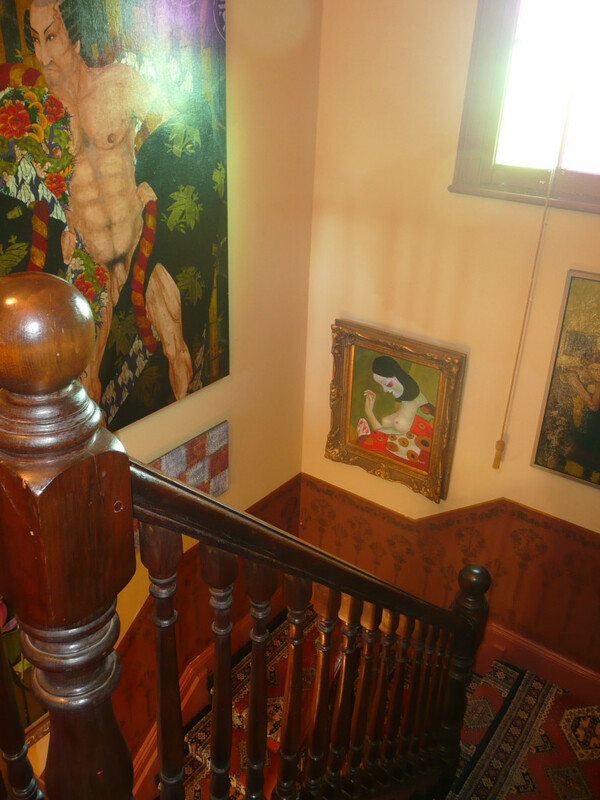 As one then moves upstairs, the walls of the entrance stairwell are decorated with a stencilled dado which, Warwick tells, is exactly the same as one seen in the television series ‘Miss Fisher Murder Mysteries’. Above the dado, a rich buttermilk is the perfect foil for the display of an eclectic selection of some of Warwick’s art collection. 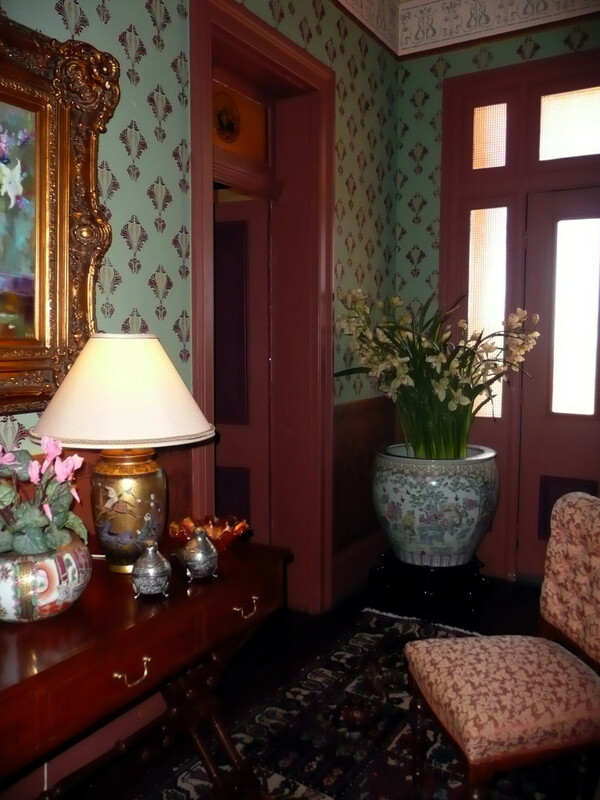 The rare and exotic treatment continues onto the upstairs landing where a Kazakhstani carpet, Portuguese lacquered table with Cararra marble inlay, elaborate screen from Hong Kong, and copious ceramic urn tell of the life’s adventures of the home’s intriguing owner. 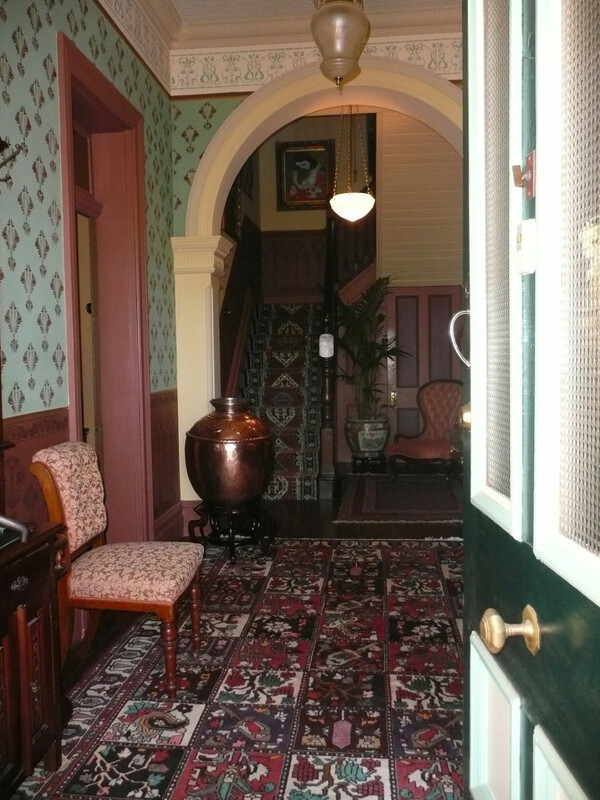 It is on this level that the three main bed and breakfast rooms are located, each one given its own unique style and personality by Warwick. The first is a rhapsody of pale mauve soft furnishings against a foil of mint green walls. Ever the artisan, Warwick made all the bedding from a rich double-check fabric as well as the matching Roman blinds at the windows, and the full drapes which – when drawn – effectively shut the world out and ensure that occupants are cocooned within this tranquil, romantic space. 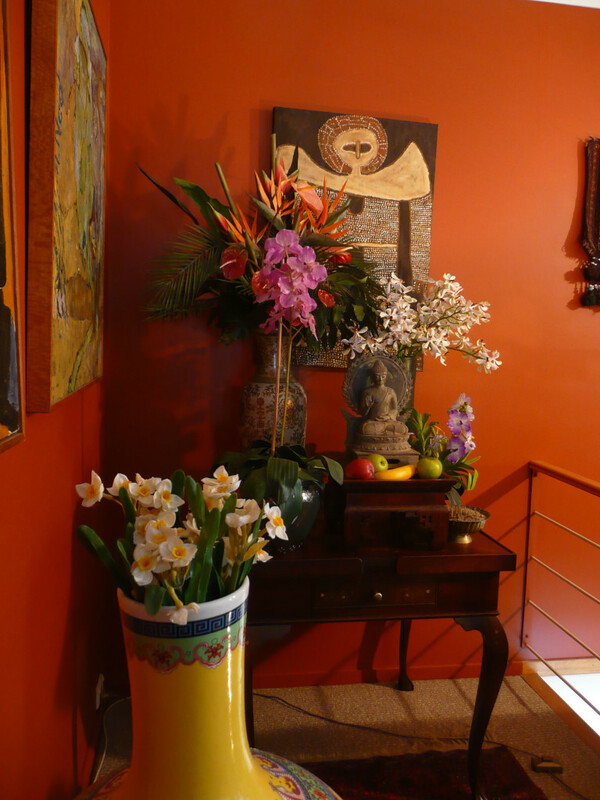 On the wall above the bed is a striking series of framed images which came from the home of American James Thompson who, in the 1950s and 60s, is credited with revitalising the Thai silk industry. 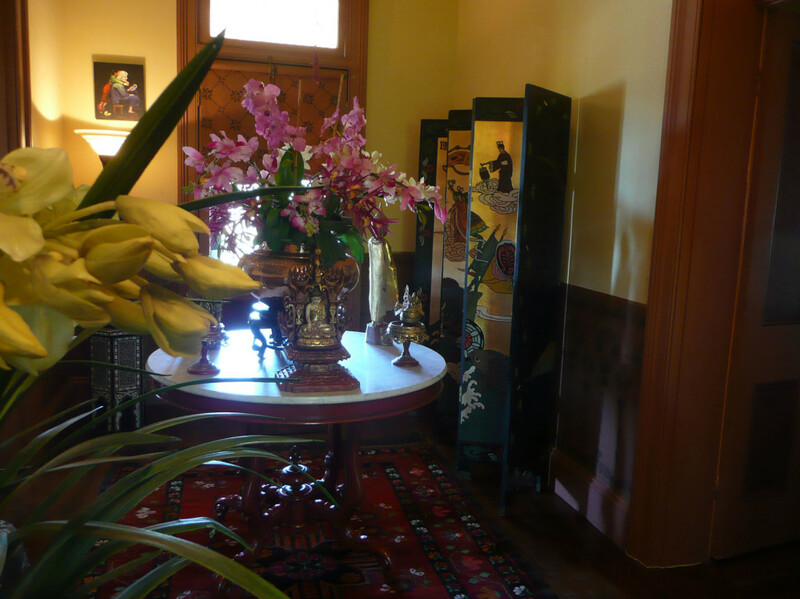 To complement the décor, an occasional table within the bay window displays a bowl of lilacs in a Tang Dynasty bowl. On the end of the bed, yet another unique touch to the room is a white vicuna – a lush throw made from the fleece of Andean camels which Warwick purchased whilst on assignment in Bolivia. The second guest bedroom is equally elegant and refined, with ‘Oatmeal’ walls by Wattyl and bedding that Warwick meticulously crafted by piecing together panels from vintage bedspreads. 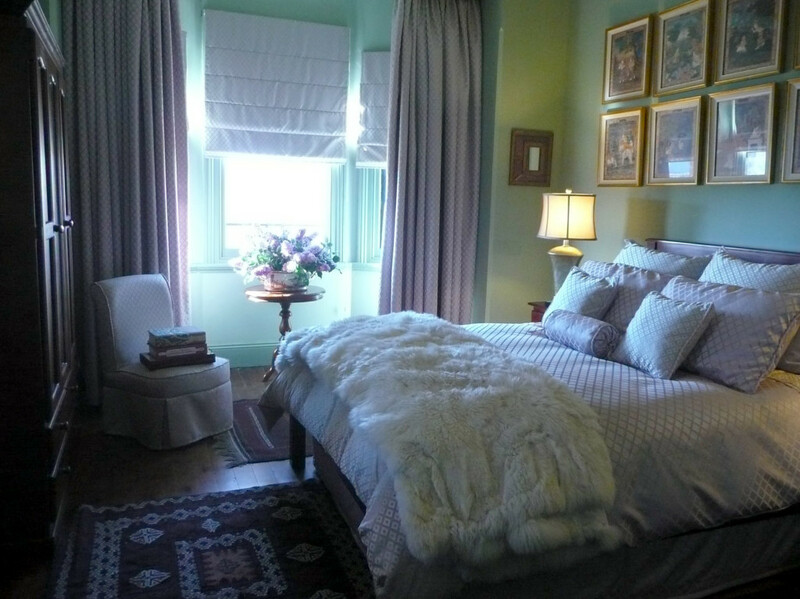 His handiwork also extends to matching pillow shams and pelmets at the windows, and drapes made of Indian corded silk. 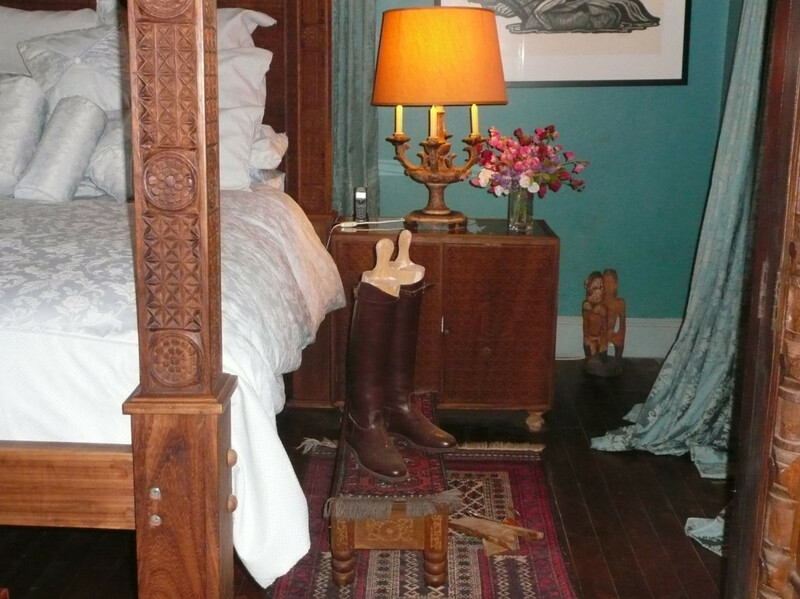 A fox fur throw on the bed, a blanket box with handpainted leather finish which Warwick found in Peru, and a rattan plantation chair which he brought back from Sri Lanka complement the other occasional pieces and colourful artworks within the space. 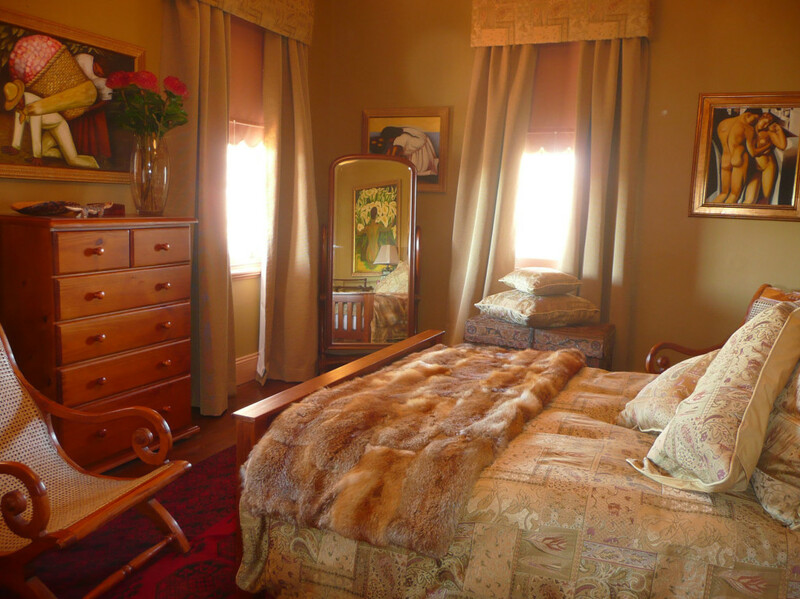 The largest of the three upstairs bedrooms is what Warwick fittingly refers to as a ‘gentlemen’s retreat’. At the top of the walls is a stunning handpainted frieze which is original to the time the house was built back in the early 1900s. To play up the richness and exotic feel of the space, Warwick painted the walls a rich shade of blue, the colour being matched to the blue in the frieze. 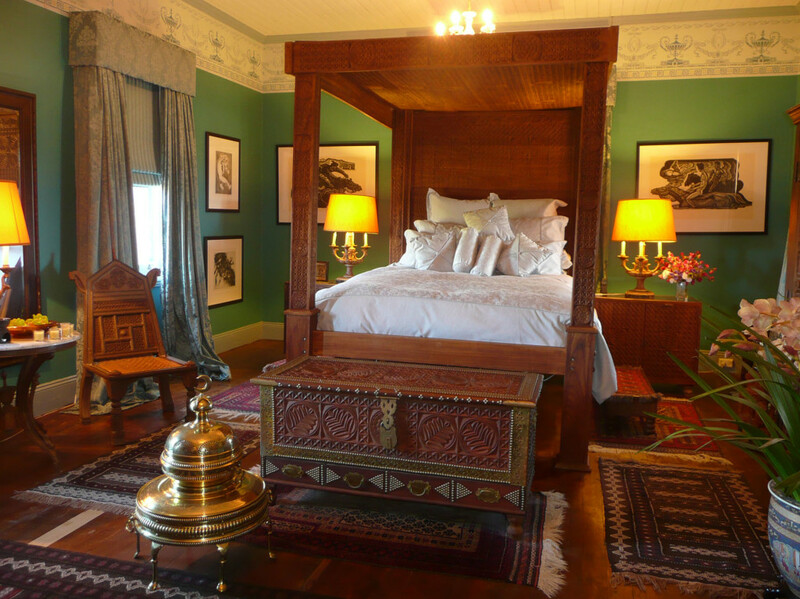 Crowning glory of the space is a hand-carved four poster bed which Warwick brought back from Zanzibar in East Africa. The palest blue silk brocade has then been used to dress the bed while, at the windows, silk duck egg blue drapes tumble onto the floor for a truly opulent look befitting such an opulent space. Grand it is, but imposing and un-welcoming Grenfell Hall could never be! Its comfortable, friendly, relaxed feel emulates from the owner himself who, within minutes of first meeting, feels like a long lost friend of old! As intriguing, interesting and perhaps even a little ‘exotic’ as the house itself, Warwick Crampton well deserves the title of ‘The Host With The Most’ as many guests have already discovered. From the lavish breakfast spread he serves – complete with homemade mueslis and locally-made jams – to the fine appointments of each of the mansion’s bedrooms; from the amazing array of world-sourced treasures which decorate each room, to the warmth and charm of the host himself, Grenfell Hall offers a unique country experience like no other. It’s a vision turned to reality … one man’s dream made for the sharing with every true country-style devotee in the land! 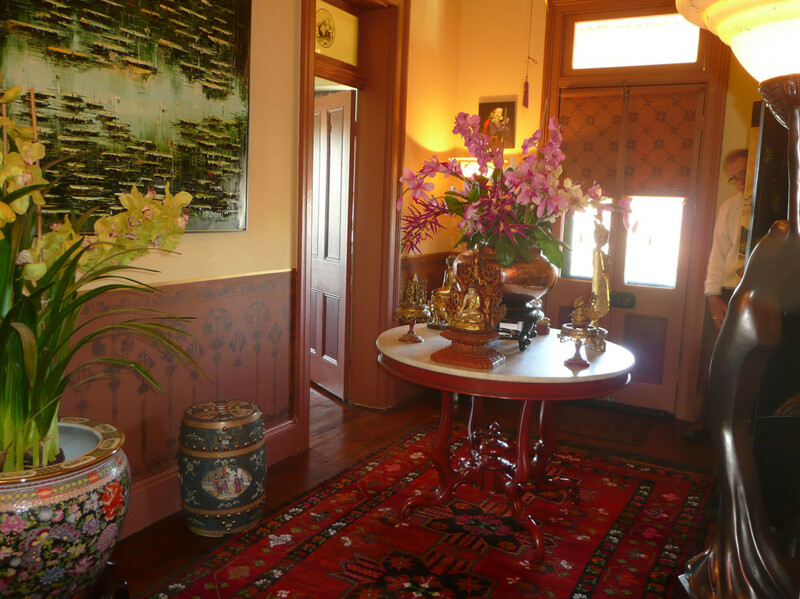 Grenfell Hall is unique within the Australian B&B landscape and is a must-stay for anyone even remotely interested in Australian heritage. 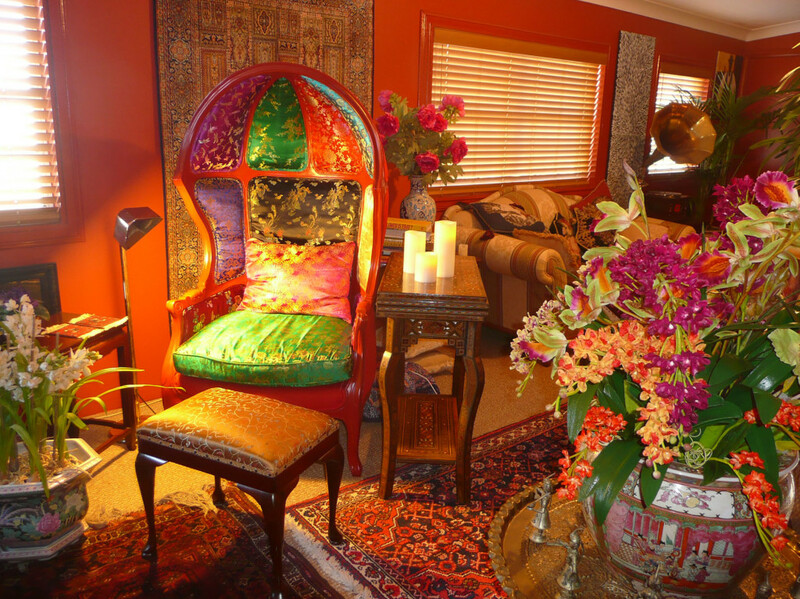 It boasts a world of unique, exotic collectables and opulent appointments. 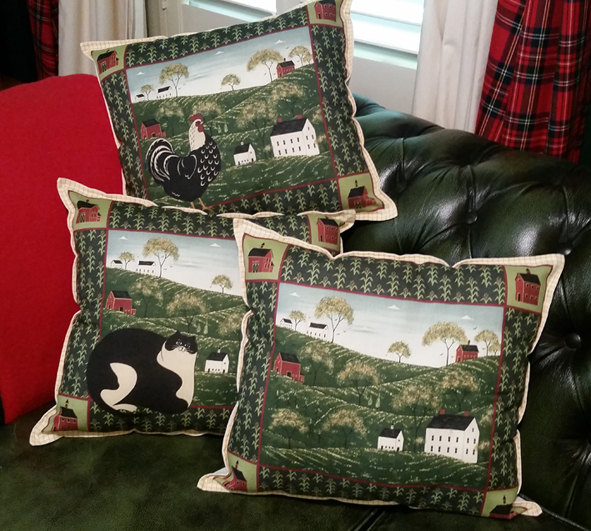 It’s a showcase of the arts and crafts of peoples from across the globe, and, as owner Warwick Crampton states, is devoted to “special people who want to indulge in a very special experience and relive the charms of a bygone era”. 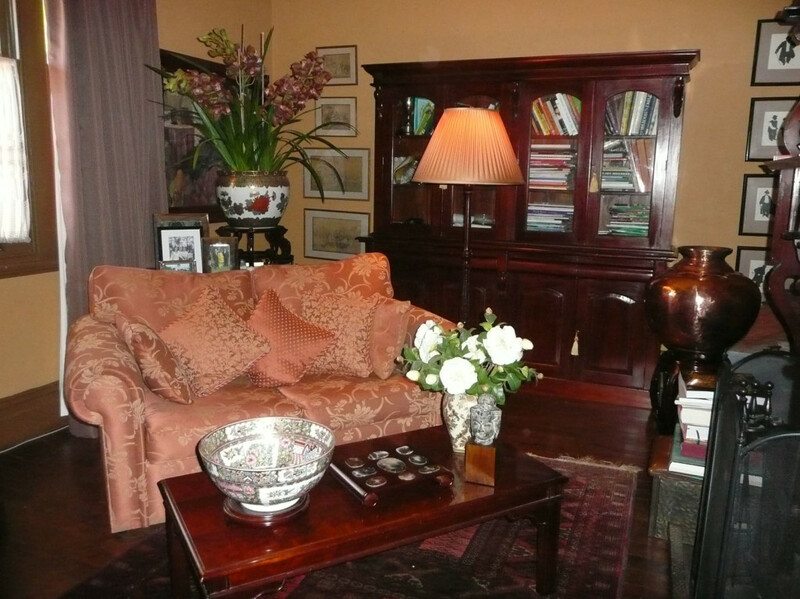 Close to the townships of Parkes, Forbes, Cowra, Orange, historic Canowindra and within a two hours drive to Canberra, Grenfell Hall welcomes guests who want just the one night’s stay, to those who want to stay for much longer and savour the unique experience that this truly remarkable venue has to offer! 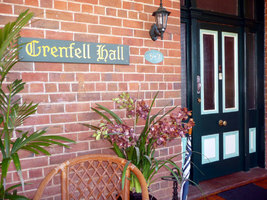 For full details contact grenfell.hall@outlook .com; search the accommodation section of www.grenfell.org.au, www.booking.com or phone Warwick direct on (02) 6343 1787, 0417 200 542.